Hello dollies! I'm back after taking a short hiatus from blogging. I was busy with Tyler Lee and having my St. Patrick's Day celebrations, I needed to get out into the real world again and not just socialise on the cyber sphere! 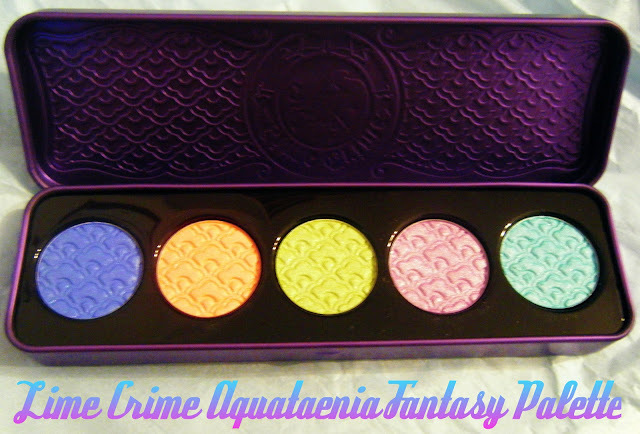 I'm back and pleased to share that my stunning new Lime Crime Aquataenia Fantasy Palette arrived today from Australia. 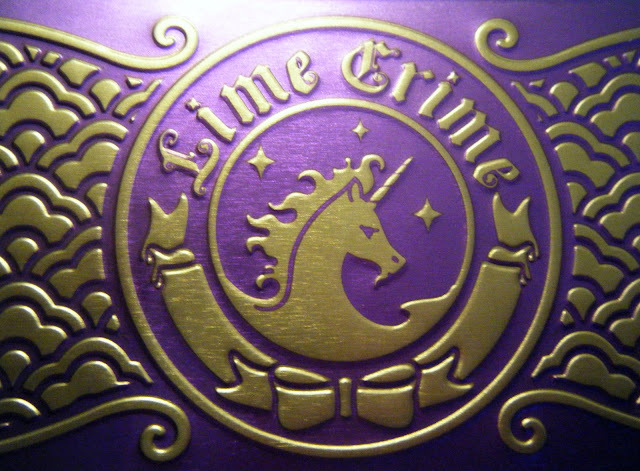 I had wanted to buy this palette from the official Lime Crime website but I could not justify spending the cost of the shipping price - I think my order came to sixty something euro or thereabouts, ridiculous money, so I resorted to Ebay. 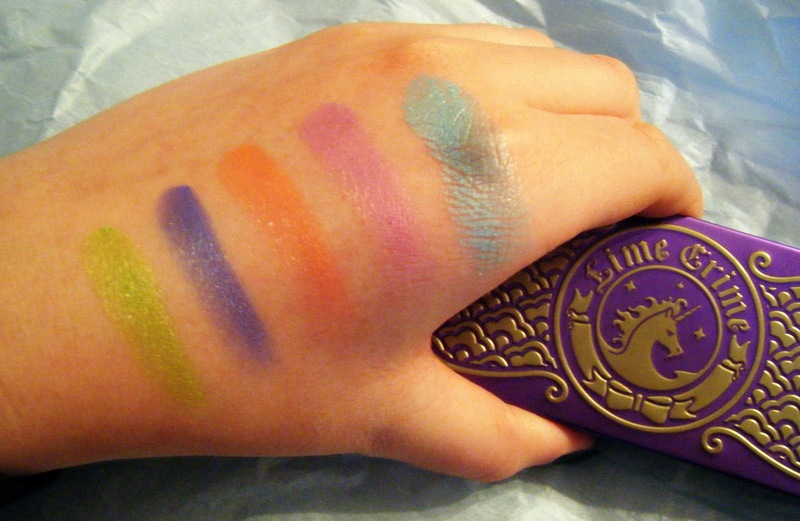 I was so happy to finally get this as I had seen amazing makeup looks done using this palette on various blogs, I can't wait to give a fantasy inspired look a go for myself later on this week so keep an eye out for that. The palette comes in a gold coloured box casing in a postal inspired theme - tying in with another one of my passions in life, the post! 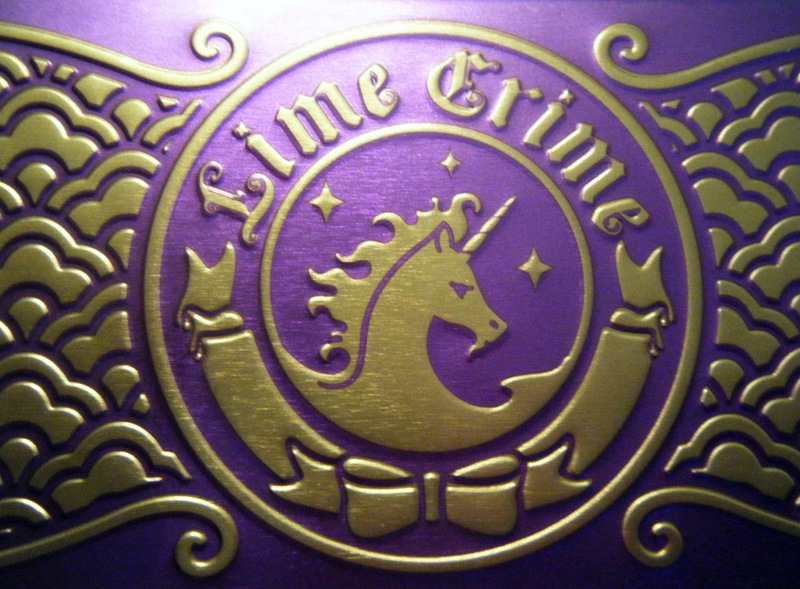 I am in love with the Lime Crime packaging, it's so pretty with the deep purple, gold embellishment and unicorn mascot. The palette itself is made from metal tin which is great as it's so durable and gives an extra special feeling to the product. What I love about Lime Crime is that the products are all vegan and not tested on animals. I am becoming more conscious of this aspect on products that I choose to buy and use so I'm delighted that Lime Crime have taken the initiative to be free from animal cruelty, this makes me love the brand even more. The fantasy palettes all contain five eye shadows and the Aquataenia shadows measure to 1.5 grams. From swatching I've realised that a little bit of these eye shadows go a long way so I predict that this palette shall last me a long time. As you can see from the swatches these eye shadows are highly pigmented and have a fabulous shimmer, the effect reminds me of sunlight hitting off water, very fitting for a water inspired palette right?! I think the shadow names are so inventive! I love the water theme. 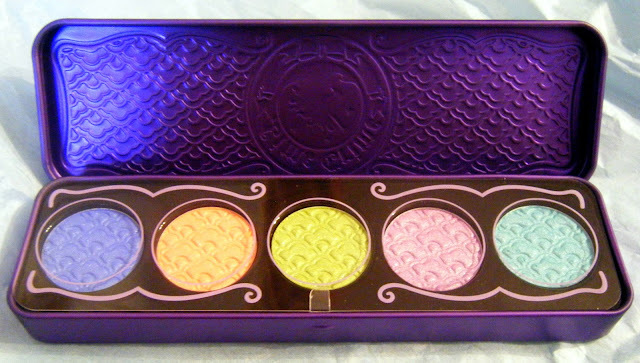 Next I'd love to buy the Lime Crime lipstick in 'Geradium' and the Palette D'Antoinette, another from the fantasy range. Both items are sadly sold out at the moment but I hope they'll be back in stock soon. Have you ever tried Lime Crime products? Are you a fan?